Hyper allows its users to take back products that were sent / delivered to a client. Create a new Return of Goods Note. For further information, please read the next section. Produce Origin Document. For further information Click here. Load Return of Goods Note. For further information Click here. In order to create a new Return of Goods Note, press the Create New button. This action will clear the Returned Items table. The fields at the top of the table are used to define the addressee of the Return of Goods note. The "contact Person" field is used to choose a person that will be mentioned in the "Intended for" title of the document, while the "Apply To" title will be referred to the company. If this note should be referred to the contact person, choose "Contact Person" in "Directed to" field. In order to add items to the Returned Items table, use the Import Items for Return button and select the required item from the lists of Tax Invoices / Delivery Notes / Orders. The selected items will be added to the Returned Items table. Use this button to add additional items to the table. 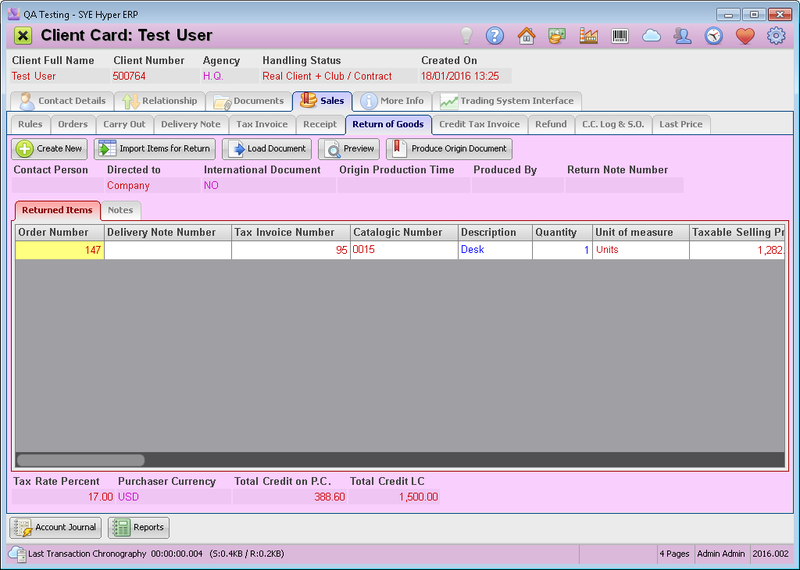 After choosing the required items, the user can add notes to be displayed on the document. Use the "Notes" tab to add notes or any other relevant information. This tab is also used for modifying the client details (for this document only). After adding the required items, use the Preview button. In order to produce the Return of Goods Note, press the Produce Origin Document button. The system will display a preview of the document. Press the OK button to approve it and produce the Return of Goods Note. In the Receipt "Notes" label, you can find the Cancellation time, Cancellation Reason and the name of the user that made the cancellation.